A law firm I once advised had a longstanding client that easily ranked as one of the world’s largest corporations. Every year, the chairman of the law firm asked the relationship partner in charge of the account how things were going. “Great, we have a terrific relationship” he was inevitably told. This company had, after all, been a client of the firm for decades. But something insidious was happening: Each year, the firm’s revenues from this client shrunk. Even though this was a full-service law firm, with over a dozen major practice areas, their business with the client had shrunk to just two small practices. As a result, they were no longer on the General Counsel’s radar—they had ceased being strategic for the client. Yes, at the end each year this client still went in the “retained” column, and there was still some light applause for the partner in charge of it, but the relationship was a shadow of its former self. The new Retention is Expansion. If you’re not gaining either share of wallet or share of mind with a client, you’re actually sliding backwards. If you aren’t broadening your footprint and impact with a client, your relationship will shrink and you risk losing it entirely. Put another way, if you aren’t one of a client’s top two or three advisors in your area of expertise—or on your way to becoming one of them—then you risk becoming increasingly irrelevant. You’re a vendor to be managed. Here’s why this is true and what you need to do about it. As competition has increased, however—and as clients have become more sophisticated and demanding—simply holding on to your existing business isn’t enough. If you are doing the same things every year for your client, and also saying the same things to them, your position will slowly erode. The Client Retention Matrix, below, illustrates this. Share of Mind is driven by your thought leadership, ability to agenda set, and your overall strategic importance to the client. Think about your relationship with your personal physician versus someone who does occasional yard maintenance for you at your house. Share of wallet measures how much of the client’s business, in your area of expertise, you have won. At-Risk Retention occurs when you are in the lower-left portion of the matrix. You provide the same service or product every year, have low overall share of wallet for the client’s spend in your area, and you are not considered a thought leader by the client—your “share of mind” is low. You can check the client retention and maybe even the high net promoter score box, but in reality your position is weak. Defensible Retention is when you’re in the upper-right part of the matrix. Here, you’re expanding both your share of wallet and your share of mind. These are the best defenses against inevitable competitive incursions. 1. As an illustration, let’s suppose you supply IT services–application development and maintenance services–each year to your client. You are managed by a director in the IT department—maybe even a vice president. 2. You are of course delighted to have a repeat, “retained” client. 3. Over time, however, your client will expect more value for their IT expenditures. They are under pressure to do more for less from their own shareholders and customers, and they will pass that pressure onto you. In fact, the CIO will likely be trying to spend less on routine “keep the lights on” IT work and more on strategic IT areas that directly support key business goals like customer acquisition, reducing time-to-market, and so on. 4. As you are squeezed more each year on price, other competitors are calling on your client—both at the director and CIO level. Different competitors will be delivering several different messages—both of which undermine you: One will be that they can do it cheaper for your client; the other, that they can help the CIO become more strategic through a variety of value-added services (that you aren’t talking to them about). 5. As time passes, these forces—client demands for more value (through lower price, mainly) and that fact that your competition will be showing your clients new ideas and new services in an effort to win their business–will conspire to inexorably devalue the client’s perception of what you do and the value you add. 6. Consequently, you will start to look somewhat worn—like one of those mid-range motels that hasn’t been very well maintained over the years. You’re probably saying, “This assumes I don’t do anything to prevent all this.” True, but answer this question: Do you or your firm have repeat clients that you are taking for granted and for which you are not upping your game each year? Of course you do. Everyone does. Maybe most of these clients are small or unimportant. But I bet some of them are large and important—and you’re not doing enough. You’re not proactively agenda setting with them. You’re not talking to them regularly about new and different ways you can help them. You’re not investing to take deep dives into issues of special interest to them. You’re not exposing them to the full range of value your firm can add. An extreme example of this is what happened in the cellphone market. When Apple’s iPhone came out in 2007 and gave customers the Internet in their palm—and they experienced its integrated suite of software and beautiful design—regular cellphones suddenly seemed like dated pieces from a museum. One of the consequences was the extraordinary collapse of traditional handset suppliers like Nokia and Motorola. In fact, Motorola’s market share of cellphone handsets went from over 50% of the North American market to almost zero in just a few years. We’ve seen other dramatic examples like this in services markets: Bill Bain introduced strategy consulting with implementation and took share from McKinsey; Egon Zehnder innovated in the executive search business and built a major firm that created its own rules of engagement; law firms like Wachtel developed the poison-pill takeover defense; Market research firms like Gallup got into the management consulting business on the back of innovative research and book publishing; and so on. Less dramatic, but common on a daily basis, is the gradual erosion caused by your competitors. They are calling on your clients and sharing their latest thinking about issues of importance. They are asking for the opportunity to compete for the business you are currently getting. They are showing more enthusiasm and creativity than you are. Add client budget pressures on top of that, and this slow erosion can turn into a catastrophic sinkhole overnight! So your goal is no longer just to retain a client. Your goal is to expand the relationship both in terms of share of wallet and share of mind to create “Defensible Retention.” You have to do this not only because it’s a positive thing to do in its own right, but also because if you don’t you may end up with nothing. • Are you gaining share of mind by consistently delivering relevant thought leadership to your client in your area of expertise, and connecting what you do to your client’s broader business issues? • Are you gaining share of wallet by both expanding into new parts of your client’s organization and by identifying new solutions you can offer them? 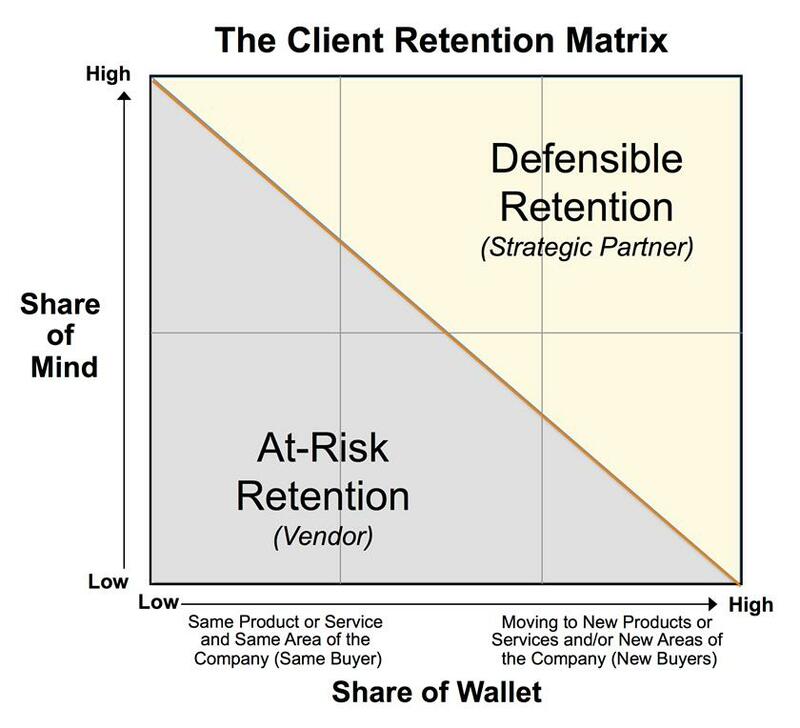 • Do you have some clients you are retaining but who are in the “At-Risk Retention” zone? What should you be doing about them?